I spent last week at my mom’s home. She’s 86 now and still living independently, but she’s beginning to think about her options for the future. No matter what she decides, she feels compelled to purge earthly belongings. Together we sorted old dishes, linens, hand crocheted doilies, lamps, you-name-it. We boxed and bagged some things to be given to family members, and we made three trips to facilities that accept donations. We worked until we were too tired to cook (yup, we ate frozen pizza twice), and we’re still not finished. Funny thing, no one who walks into her home can tell that we’ve done anything because we focused only on the contents of cupboards, closets, and drawers. Relatively speaking, she had a lot less stuff than most people, but Round 2 is yet to come. Helping Mom brought back memories of purging my own home last winter in preparation to move aboard the sailboat. I either dumped, donated, sold, or gave away nearly every earthly belonging. I disposed of some stuff easily. Who really needs four loaf pans, anyway? Or clothes that don’t fit? Other belongings, not so much. Emotional attachment is sometimes difficult to release. Nonetheless, nine months later I can honestly say I haven’t yearned for any of the material possessions to which I bid goodbye. I enjoy the freedom that comes from not having to maintain things. And less housework is always good, yes? Another perk—should I suddenly die, my kids will have no horror stories to tell their friends about having to purge our home. Consumers spent more than $16 billion dollars shopping online last weekend. I can’t even wrap my head around that sum. How many items purchased were truly necessary? I wonder how many were whims or wants. How many items bought will disappear into a cupboard or basement only to be used a couple of times before being recycled in a garage sale? Could some of that money have been better spent—on investing in what lasts for eternity, for instance? Jesus said, “Don’t store up treasures here on earth, where they can be eaten by moths and get rusty, and where thieves break in and steal. 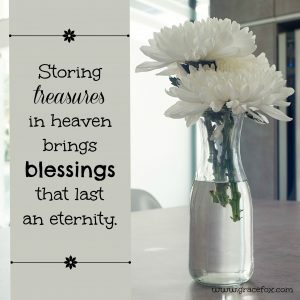 Store up your treasures in heaven, where they will never become moth-eaten or rusty and where they will be safe from thieves. Wherever your treasure is, there your heart and thoughts will also be” (Matthew 6:19-21 NLT). For many, Christmas shopping is far from over. As we consider our shopping lists and the great sales that come after Christmas, let’s ask God to help us keep His perspective. Let’s practice self-discipline in buying material things and remember to also invest in what matters most—people’s souls. We can easily do so through donating to non-profits such as The Salvation Army, a local crisis pregnancy center, Angel Tree, and media-based ministries such as Focus on the Family or Insight for Living. Mission organizations will also welcome donations so they can continue to spread the Gospel far and wide. Where our treasure is, there will our hearts and thoughts also be. Let’s treasure those things that matter most. American Thanksgiving weekend has arrived, and Christmas is on the way. Holidays draw families together—at least in the physical sense. But sometimes they become an emotional testing ground. This is nothing new. Recall Hannah’s situation. She shared her husband with a second wife, Peninnah. As though that wasn’t enough to create family tension, her husband played favorites. He clearly loved Hannah more, and that made Peninnah jealous. Every year the family traveled to Shiloh to worship at the Tabernacle, and every year the same emotions flared. Peninnah mocked Hannah’s inability to conceive, and Hannah was reduced to tears. She was so distressed that she couldn’t even eat (1 Samuel 1:3-7). How do holiday family dynamics work for you? Maybe you’re thinking, Great! We truly love each other and enjoy spending time together.But perhaps you’re thinking otherwise: Heaven help us all. Spending time together is ‘way too stressful. If the latter describes you or someone you know, then here are three insights we can learn from Hannah’s situation. Every year on that holiday, Peninnah watched her husband demonstrate that he loved Hannah more than he loved her. Imagine the rejection she felt. She reacted in an inappropriate manner, and her response hurt Hannah deeply. Do you have a relative who says or does hurtful things when you’re together? Remember—hurting people hurt people. It’s probable that your family member has emotional pain that hasn’t been addressed. Ask God to show you the root cause for that behavior and to help you see that person through His eyes. Hannah experienced such anguish that she couldn’t even eat. Finally, one year in deep distress, she poured out her heart to the Lord (1 Samuel 1:10-20). Doing so lifted her burden and changed her perspective. She returned a transformed woman knowing the Lord cared deeply for her needs. To whom do you turn when you feel upset about a particular family member? Pour out your heart to the Lord. He knows every detail and understands the dynamics. Invite Him into your situation and expect Him to work. His answer might not look like what you think it should, but that’s okay—it’ll be better! Hannah worshiped the Lord in her distress. Her burden lifted when her focus changed from her pain to His character. Ruth Graham Bell once said that worry and worship cannot share the same space. Rather than worry about the next family holiday, begin now to worship God for His faithfulness, wisdom, and love. When the holiday begins and the same old stress raises its head, choose to worship God for His grace and forgiveness in your life and for the Holy Spirit given to you so that you might live victoriously. I get to spend the weekend with our son and his family. Every time we visit, our grandkids ask this question: “Grandma, would you please tell us a story from your life?” This time I’ll tell them about how God provided a different car following our accident on October 31st. Our 14-year-old Toyota Matrix served us well for countless miles. Exactly how many miles is unknown because the odometer stopped about three years ago when it rolled over to 299,999 km, but we suspect they surpassed 400,000. Several weeks ago the car started making bad sounds. On Canadian Thanksgiving weekend as we drove home from sightseeing with our kids, we wondered whether we’d be stranded beside the highway. We gave thanks for having towing insurance. Then the clutch broke. And the oil needed changing. And the windshield wipers needed replacing. All of these came within a week of our car being totaled in a four-car pileup. My husband and I have witnessed God do some pretty amazing things or us, His kids. Recalling His faithfulness gave us the courage to trust Him to provide a replacement vehicle. How He would do so with our limited budget was anyone’s guess. Here’s what He did. God has once again blown us away with His provision. 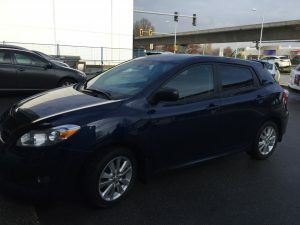 He’s given us a different car (a 2010 Toyota Matrix with only 104,000 km), and He spared us from having to make monthly payments. As missionaries living on faith support, that is a HUGE blessing. I can hardly wait to share this story with the grandkids. 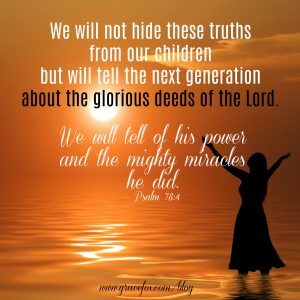 Psalm 78:4 says, “We will not hide these truths from our children but will tell the next generation about the glorious deeds of the LORD. We will tell of his power and the mighty miracles he did.” Telling our faith stories to the younger generations is vital so that they might open their hearts to the Lord and learn to love, obey, and trust Him. As the psalmist writes: “So each generation can set its hope anew on God, remembering his glorious miracles and obeying his commands” (Psalm 78:7). My eldest granddaughter has asked me to put my stories into a book. I’ve already included many in my devotions, but they’re scattered here and there. Maybe it’s time to collect them into one place as a legacy for my family and as a means of bringing glory to God. If a little person asked you to tell a story from your life, how would you respond? I attended the Peace River Bible Institute missions conference this week. One presenter invited mission reps to a session about identifying and overcoming burnout. He noted that burnout happens when hope is lost, and hope is lost when we fall into faulty thinking about who God is. This session really resonated with me. Last Saturday I spoke at the RADIANT conference, and my plenary message basically taught the same premise. So does my new Bible study that’s scheduled for release this month through First Place 4 Health. Here’s an example of how this works based on personal experience. Years ago, when Gene and I entered career ministry at Camp Homewood, we were required to raise financial support for our family of five. Donations were tallied and cheques issued on the 10thof each month. We lived above the office for the first three years. A flight of stairs separated us from the staff mailboxes into which those cheques were placed. I ran those stairs several times each pay day, waiting and watching for our cheque to appear in our box. Why? Because the fear of financial insecurity held me captive. Would we have enough to feed our family? Would we have enough to buy gas and ferry tickets? What about kids’ winter coat and orthodontic bills? Several years passed, often filled with mounting and unexpected expenses. Stress nearly took me to the brink. I absolutely professed God as my provider, but on financial uncertainty led my thoughts down the wrong path. Subconsciously I began to question God’s care for our family’s needs. For a short while I wrestled with anger toward Him for bringing us to camp only to abandon us there. In retrospect, I resembled the Israelites who accused God of bringing them out of Egypt only to die in the wilderness. 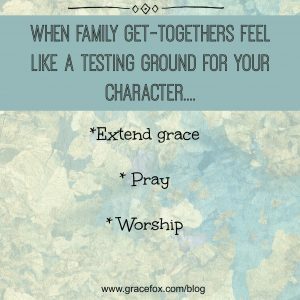 Aligning my thoughts about God with truth about His character was vital to restoring hope. I began meditating on Bible verses that reminded me of His glory and majesty. I turned those verses to prayer and expressed them aloud as I walked for exercise. I also filled my home with praise music and sang along with the lyrics while doing chores. When doubts about God’s integrity and intent toward our family threatened to raise their heads, I squelched them with the truth: God had a plan for our family, and He would fulfill His purpose. He’d called us to this ministry, and He would provide. Doing anything less would be to deny His nature. Peace replaced fear. Hope returned, and courage to trust God for bigger things came with it. Our thoughts about God are the most important thing about us, so let’s strive to ensure our thoughts are based on truth. Have you ever lost hope? If so, how did believing an untruth about God’s character play a role? Life often brings challenges, disappointments, and heartaches. As I write this, I’m thinking of the families affected by Pittsburgh’s tragedy and the plane crash in Indonesia. What can one say to console them? Closer to home, I’m thinking of three friends whose husbands—all of them professing Jesus followers—have walked away from their marriages since June. I’m thinking of family and friends struggling with cancer and chronic illnesses, and one who recently entered widowhood. When life hurts, our human bent focuses on fear. We might entertain thoughts of our circumstances being unfair. We may even question God’s goodness. Times like this test our faith. Here are three truths to remember even if God seems silent or doesn’t rush to our rescue as we wish He would. Truth #1 – God never changes. “I am the LORD, and I do not change,” He declares in Malachi 3:6. In the midst of our uncertainties, His rock-sure stability and promises remain the same. Truth #2 – God is always ready to help. Psalm 46:1 says, “God is our refuge and strength, always ready to help in times of trouble.” We can call on Him day or night. He’s never too busy to hear our cries. 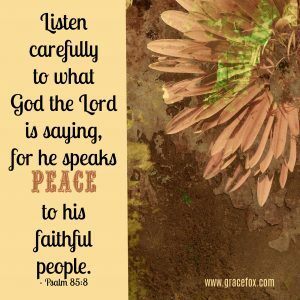 Truth #3 – God is good. “Taste and see that the LORD is good. Oh, the joys of those who trust in him,” says Psalm 34:8. When life hurts, God’s goodness comforts and carries us. It surrounds us like a shield, fills us with strength, and make us overcomers. 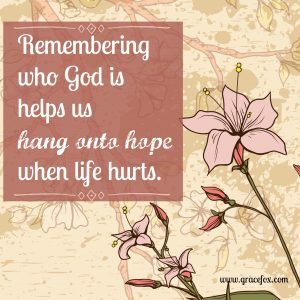 Remembering truths about who God is helps us hang onto hope when life hurts. What truth about His character brings you hope? Little voices in my head vie for my attention. They start the moment I wake. The voice that tells me to go the gym wins, but the argument continues while I’m on the treadmill. The voices go back and forth about what snacks I should or should not eat and the size of my meal portions. They squabble about other matters, too. The enemy of our soul whispers lies bent on our destruction, but the Holy Spirit speaks words meant to strengthen and encourage us. Listen well, my friend. Learn to discern who’s speaking. Heed only the voice that speaks peace and life, and you’ll flourish. Question: So—am I the only one who hears little voices throughout the day? Or do you hear them, too? Share some examples with us, and tell us how the Lord’s words have spoken peace and life to you recently. Most of us can relate to this woman’s feelings. Our struggle might be different than hers, but we, too, experience victories and losses. Sometimes we mimic a mighty warrior, but other times not so much. Despite our best intentions, we do the very thing we vowed we’d never do again. We wonder if we’ll ever get it right. Truth be told, we’ll never get it right all the time this side of heaven. But here’s one thing we cando—ask God to give us hearts that joyfully obey His commands and then thank Him for being faithful to complete the good work He has begun in us. 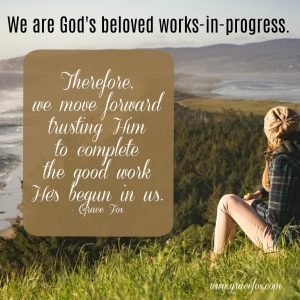 He knows we’re works-in-progress, and He patiently keeps changing and refining us to make us more like Jesus. Knowing He never gives up on us gives us the ability to extend grace to ourselves and persevere. For what area in your life are you trusting God to complete the good work He has begun? As for me, one of those areas is in my wellness journey. Traveling so much makes it hard to stay on track with healthy eating and regular exercise, and I seriously don’t want to revert to old ways and habits. I have to trust God for victory in this area of my life. Now it’s your turn to share with the rest of us. Have you ever opened your mouth and said something before engaging your brain? If so, how did that work for you? I’ve been known to do this on occasion, and it didn’t go well. As a result, I’ve begun using this acronym as a resource to help me determine whether or not I really need to say the words waiting to roll off my tongue. T – Are our words true? If not, zip the lip immediately. Sometimes our words are true but they’re gossip. Sometimes they’re true but blurted in the wrong spirit. They may be true, but they could be considered boastful. Not every truthful word needs to be expressed. H – Are our words helpful? Will they contribute to another person’s well-being, or are they just a personal rant? Are they spoken at the right time, or might they be better received in a few days or weeks? I – Are our words inspirational? Our speech ought to inspire hope and encouragement. That doesn’t mean we avoid saying the hard thing to someone who’s heading the wrong direction, but it does mean our words are well chosen and spoken with love. N – Are our words necessary? Not everything we want to say needs to be said. The more we speak, the more prone we are to say something we later regret. When with others, let’s listen well and then make our words count. K – Are our words kind? Do they remind others that they matter to us, or do they criticize and belittle? 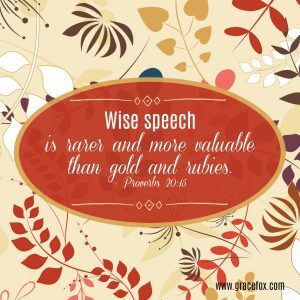 Wise speech carries the power of life and hope. Using an acronym like “THINK” will help ensure our words bring a smile to God’s face. Does one of the letters in this acronym resonate with you more than the others? If so, which one? 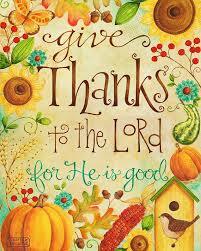 Today I give thanks for ______________. Okay–now it’s your turn to finish the sentence. You don’t have to be Canadian to join the shout-out! We might look in the mirror and think we’re doing okay, maybe even a tad bit better than the next person. But, human nature being what it is, we sometimes deceive ourselves. We deny that we’re struggling with an issue or fail to acknowledge our sin, and then we wonder why we feel stuck. King David gave some great advice learned the hard way. After confessing adultery, he wrote, “For I was born a sinner—yes, from the moment my mother conceived me. But you desire honesty from the heart, so you can teach me to be wise in my inmost being” (Psalm 51:5-6NLT). Being honest with ourselves, others, and God requires admitting we’re imperfect. Doing so is humbling, but the rewards are worth it. Honesty—admitting when we’ve messed up—opens the door for forgiveness, reconciliation, and restoration. It paves the way for us to grow in wisdom and learn from our mistakes. Here’s one way in which I’m learning to apply this truth: I’ve shared publicly about my wellness journey and how I’ve lost about 65 pounds. I maintained that weight loss for more than a year. But moving aboard the sailboat combined with increased ministry travels has challenged the nice routine I’d established, and I’ve gained several pounds back. My human bent is expert at making excuses, but honesty from the heart admits that I’ve made unhealthy food choices especially while traveling. I’ve also enjoyed a few too many chips in secret while alone on the boat. Ouch. Being honest from my heart—that my weight gain is a direct result of my choices—is humbling. But admitting it and taking responsibility for it makes me wiser in my inmost being—and able to turn this around. 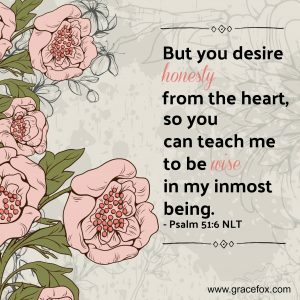 How does this truth about honesty from the heart apply to your life?